I have one drawer in my kitchen reserved for tea towels but alas, it's full and getting hard to close. I blame artists like Kristen Chandler for this common kitchen based ailment. Her beautiful textiles leave me wanting more. Is that so wrong? 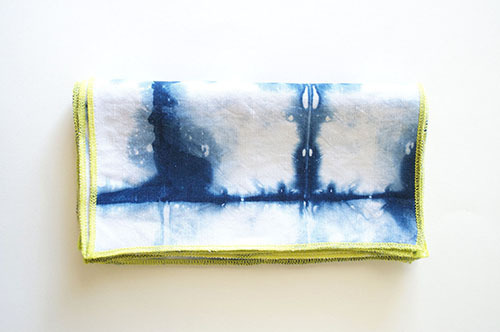 It's fun to see Kristen play with different dying techniques, like hand marbling these tea towels and pocket squares. I love how Kristen finds most of her natural dyes by walking out her back door to fetch ragweed and pokeberries. She likes to experiment with natural dyes, creating interesting patterns without a heavy hand.